In 1981 Chile's military government dictated a new Water Code that radically changed the country's previous water rights system by strengthening private property rights, favoring market incentives, and reducing state regulation. Against the Current: Privatization, Water Markets, and the State in Chile is the first empirical and interdisciplinary study of water markets in Chile, which is the leading international example of free market water policies. Against the Current: Privatization, Water Markets, and the State in Chile challenges the glowing reports given by neoliberals in Chile and the World Bank, showing that the results of this economic experiment have actually been rather mixed. Within the agricultural sector the Water Code has worked fairly well, although the market incentives to conserve water have been ineffective and water rights trading has been less active than expected. The Code's impact has been more negative at the level of river basins, where the institutional framework has revealed critical flaws in coordinating multiple water users and resolving conflicts. 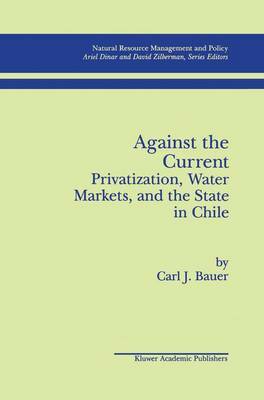 Against the Current: Privatization, Water Markets, and the State in Chile combines law, political economy, and geography to analyze the disadvantages, problems, and wider contexts of water markets. This book will appeal to everyone interested in property rights, market-friendly environmental policies, the political economy of sustainable development, and the intersection of economics with law and institutions.